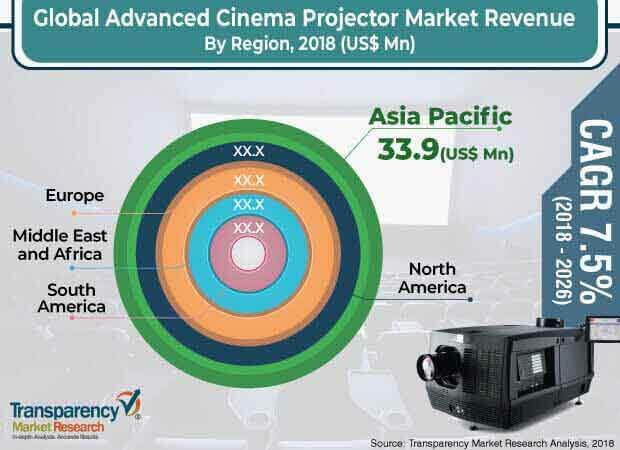 According to a new market research report titled ‘Advanced Cinema Projector Market – Global Industry Analysis, Size, Share, Growth, Trends, and Forecast, 2018–2026,’ published by Transparency Market Research the global advanced cinema projector market is expected to reach value of US$ 174.8 Mn by 2026, expanding at a CAGR of 7.5% from 2018 to 2026. According to the report, the global market is expected to be influenced by a range of macroeconomic and market-specific factors during the forecast period. In terms of demand, Asia Pacific is projected to lead the global market, and expanding at a CAGR of 8.3% between 2018 and 2026. Technological advancements in cinema projectors and increasing attention toward entertainment in Asia Pacific are anticipated to drive the market in the region during the forecast period. The global advanced cinema projector market is projected to expand at a significant growth rate during the forecast period, owing to technological advancements in cinema projectors across the world. Advanced cinema projectors offer better-quality picture and they use the 3D technology. With the help of the 3D technology, advanced cinema projectors can handle multiple 3D formats and can convert 2D pictures into 3D pictures. Also, use of high brightness and resolution helps watch movies with clear and best-quality picture. These factors are likely to augment the global advanced cinema projector market in the next few years. The global advanced cinema projector market has been broadly segmented based on technology, resolution, brightness, application, and region. In terms of technology, the market has been divided into DLP, LCD, and LED. Among these, the DLP segment holds a significant share of the market. The segment is anticipated to expand at a CAGR of 7.6% throughout the forecast period. Based on resolution, the market has been classified into less than 2K, 4K, and 8K. Among these, the 2K segment held a prominent i.e. 59.6% share of the global advanced cinema projector market in 2017. It was followed by the 4K segment. In terms of brightness, the global market has been classified into less than 4999 lumens, 5000–10000 lumens, and above 10000 lumens. Among these, the above 10,000 lumens segment held a significant share of the global market in 2017. It is expected to expand at a CAGR of 8.0% during the forecast period. In terms of application, the global cinema projector market has been classified into commercial and residential. The commercial segment held a major share of the global market in 2017. It is anticipated to expand at a CAGR of 7.4% during the forecast period. In terms of region, the global advanced cinema projector market has been segregated into North America, Europe, Asia Pacific, Middle East & Africa, and South America. In terms of revenue, Asia Pacific held a leading share of the global advanced cinema projector market in 2017. The market in the region is anticipated to expand at a CAGR of 8.3% during the forecast period. Emergence of new and advanced technologies and increasing number of cinema halls and multiplexes have led to rise in the adoption of advanced cinema projectors. In terms of revenue, China holds a major share of the advanced cinema projector market in Asia Pacific, followed by India. Moreover, in terms of revenue, the market in India is anticipated to expand at a significant CAGR of 9.1% during the forecast period, due to increasing investments in cinema halls in the country. The research study includes profiles of leading companies operating in the global advanced cinema projector market. Market players have been profiled in terms of attributes such as company overview, financial overview, business strategies, and recent developments. Some of the key players operating in the global market are BenQ Group, Barco NV, Sony Corporation, Seiko Epson Corporation, Canon Inc., Delta Electronics, Inc., LG Electronics, Christie Digital Systems USA, Inc., Panasonic Corporation, and Hitachi Digital Media Groups.